If you're unfamiliar with composer Ramin Djawadi's work, then I strongly advise you to seek out his scores for A Wrinkle in Time, Sharknado, and his soundtracks for Game of Thrones (we've previously reviewed the releases for season 3, 5 and 6). 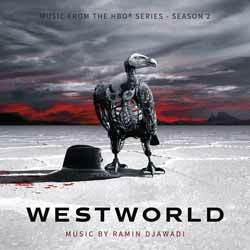 The soundtrack to the second season of Westworld contains 29 tracks (1 hr, 39 min, 20 sec) and is a well balanced score, packed to bursting with intricate themes. It also incorporates music that you'll have heard before, outside of the show. These include Scott Joplin's 1902 classic piano rag 'The Entertainer' (which was used as the theme music for the The Sting (1973); Kanye West's 'Runaway'; Nirvana's 'Heart Shaped Box'; and The Rolling Stones's 'Paint it Black' - all of which Djawadi masterfully transforms into orchestral works. It's not overly surprising that this is an enjoyable score, given the composer involved, and the fact that an entire season's music has been trawled through to pick out the highlights. Fans of the show will love, as will soundtrack collectors who enjoy rich, deep scores.